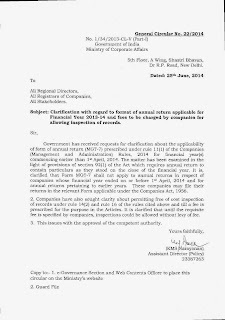 MCA UPDATE Clarification on Format of Annual Return applicable for Financial Year 2013-14 and Fees to be charged by Companies for allowing Inspection of Records. § Or should we use new format as per Companies Act 2013 ? 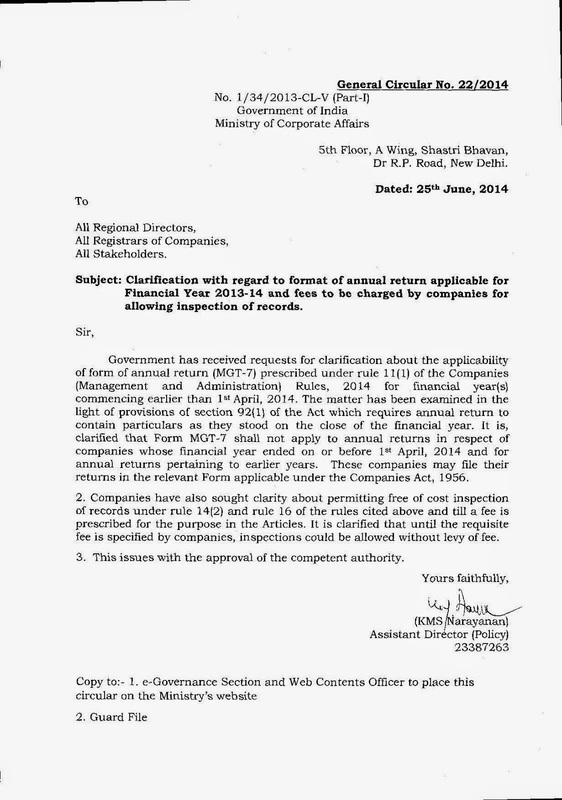 v We have to use old format of AR given under Companies Act 1956. Whether fees to be charged by Companies for allowing Inspection of Records? 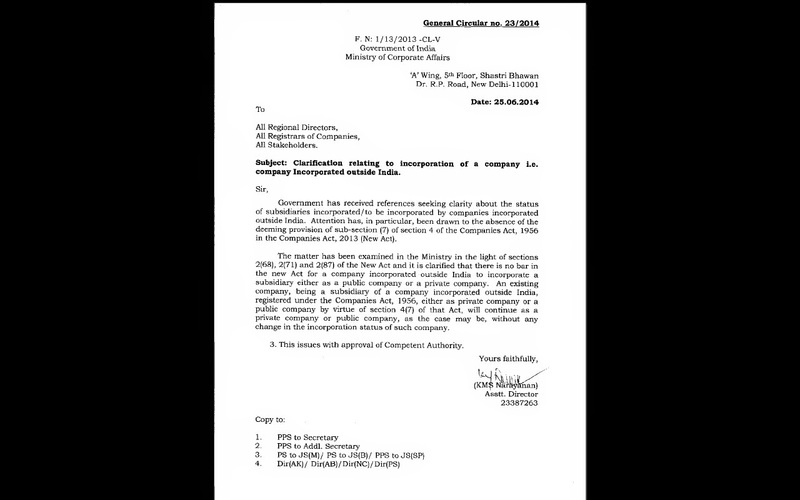 vClarified that until the requisite fee is specified by companies, inspections could be allowed wlthout lely of fee. 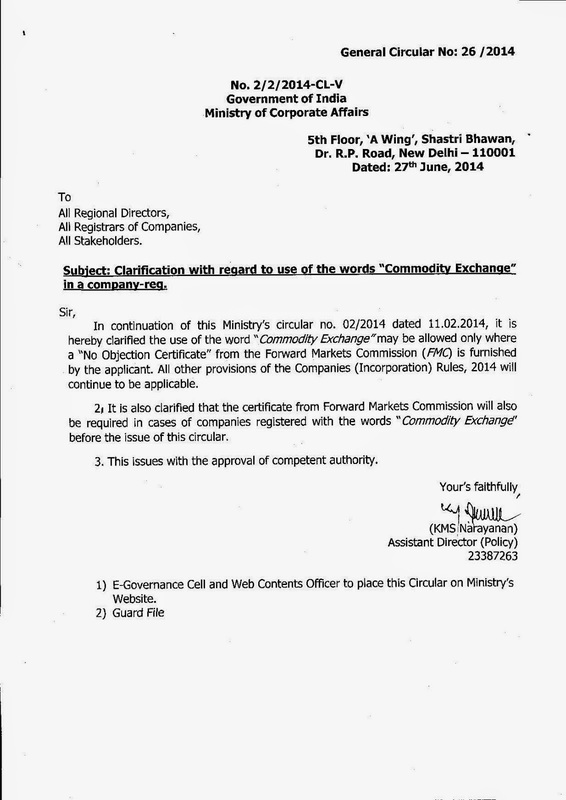 Clarification with regard to use of the words "Commodity Exchange" in a company-reg. The assessee, a bank, - was held liable u/s 201(1) and 201(1A) r.w.s. 194 A - for failure to withholding TDS on interest paid by it to customers on deposits placed by them with the assessee. The assessee claimed that it could not be treated as an assessee-in-default as no steps had been taken to determine whether the recipients of the interest had paid tax thereon. (i) A short deduction of tax at source, by itself does not result in a legally sustainable demand u/s 201(1) and u/s 201(1A). 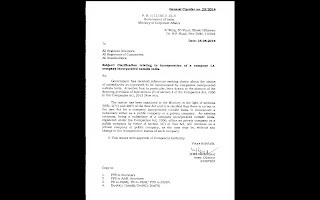 As held in Hindustan Coca Cola Beverages vs. CIT 293 ITR 226, taxes cannot be recovered once again from the assessee in a situation in which the recipient of income has paid due taxes on income embedded in the payments from which tax withholding requirements were not fully or partly, complied with. (ii) S. 201(1) seeks to make good any loss to revenue on account of lapse by the assessee tax deductor. (iv) As regards the levy of interest u/s 201(1A), though the interest is compensatory in nature and is applicable whether or not the assessee was at fault, it is applicable for the period from the date on which tax was required to be deducted till the date when tax was eventually paid. In a case in which the recipient of income had no tax liability embedded in such payments, there will obviously be no question of delay in realization of taxes and s. 201(1A) will not come into play at all. 30-6-14 (Monday) is LAST DATE to file Return of Deposits on 1-4-14 in DPT-4 attached to GNL-2 by ALL Cos. Repay Deposits by 31-3-15 or by due date, if earlier. E-file Wealth Tax Returns with Digital Signature for those assessees who are liable to get accounts audited under section 44AB from assessment year 2014-15. In other cases Individuals/HUF can also file returns manually for the assessment year 2014-15 if no Tax Audit. 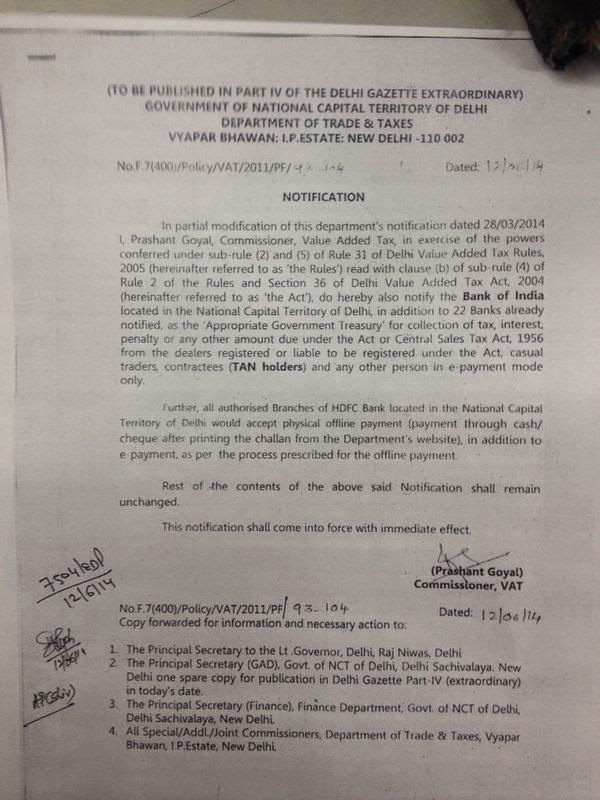 IT Notification number 32 of dated 23-6-14. A transfer of shares under a family arrangement is for a determinable "consideration" & is not "voluntary". s. 122 of the Transfer of Property Act 1882 provides that a transfer of moveable or immovable property can be treated as a gift only if the same is made voluntarily and without any consideration. It cannot be said that a family arrangement is "without consideration". In CWT vs. HH Vijayaba, Dowgner Maharani Saheb of Bhavnagar Palace 117 ITR 784 (SC) it was held that a family settlement or family arrangement which is to buy peace is for good consideration and creates an enforceable agreement between the parties. the purpose of the family arrangement was to equalize the holdings between the respective families of three brothers. Therefore, it cannot be said that consideration for transfer of shares cannot be measured in terms of money or monies worth. The equalization of wealth has only monetary connotation. Whether the receipt of shares under the family arrangement was "voluntary" or not, the term "voluntary" is defined to mean "free choice; done with free will; without any compulsion ..". The family arrangement cannot be said to be voluntary because it was enforceable and binding on the parties and with the purpose of equalization of wealth of the family members, which had monetary connotation. Taxing Narad has invited you to join Twitter! In the absence of application seeking condonation of delay, the Commissioner Appeal should inform the assessee to file an application for condonation of delay before dismissing the appeal on the ground of it being barred by limitation. the Ahmedabad CESTAT held that in the absence of application seeking condonation of delay, the Commissioner Appeal should inform the assessee to file an application for condonation of delay before dismissing the appeal on the ground of it being barred by limitation. The assessee could not file the appeal before the Commissioner (Appeals) within the time period prescribed (2 months) by Section 85 of the Finance Act, 1994 and delayed it by 10 days. Further, the assessee did not submit the application for condonation of delay and the Commissioner rejected the appeal as being barred by limitation. The Ahmedabad CESTAT observed that though the appeal has been filed after the statutory period of two months and no application for condonation of delay has been filed but the appellate authority should have informed the assessee to file an application for condonation of delay. 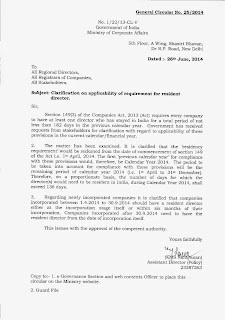 Moreover, the delayed period also lies within the power vested with the appellate authority in terms of proviso to Section 85(3A) which provides that the Commissioner (Appeals) has the power to condone the delay by a further period of one month subject to the condition that the appellant was prevented by sufficient cause from filing the appeal. Therefore, the appeal could not be rejected merely on non-filing of application for condonation of delay. Today Ministry of Corporate Affairs considering the procedural aspects on e-voting and clarity on demand of poll and postal ballot, it has been decided not to treat the relevant e-voting provisions as mandatory till 31st December 2014. In view of this till December 2014, e-voting is not mandatory for companies. 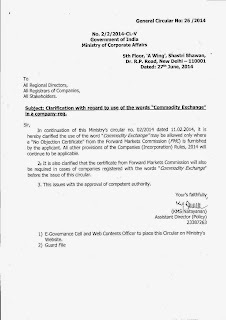 MCA Circular No.20 dated 17th June 2014. The department filed an appeal before the Tribunal raising several grounds relating to s. 69C etc. 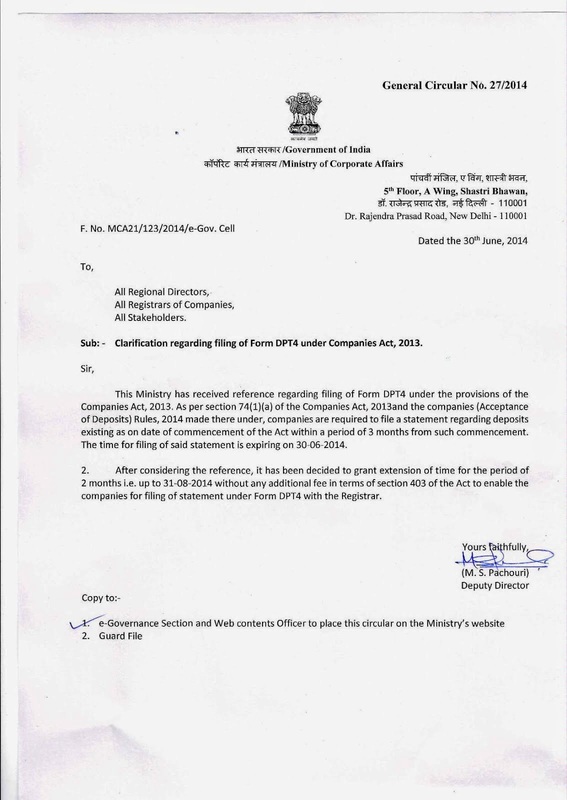 The CIT(A) had allowed relief to the assessee on the ground that as the expenses were duly recorded in the books and there was no dispute as to their genuineness, s. 69C had no application. Therefore we award a token cost of Rs. 5,000 upon the CIT who has given the authorisation and cost of Rs. 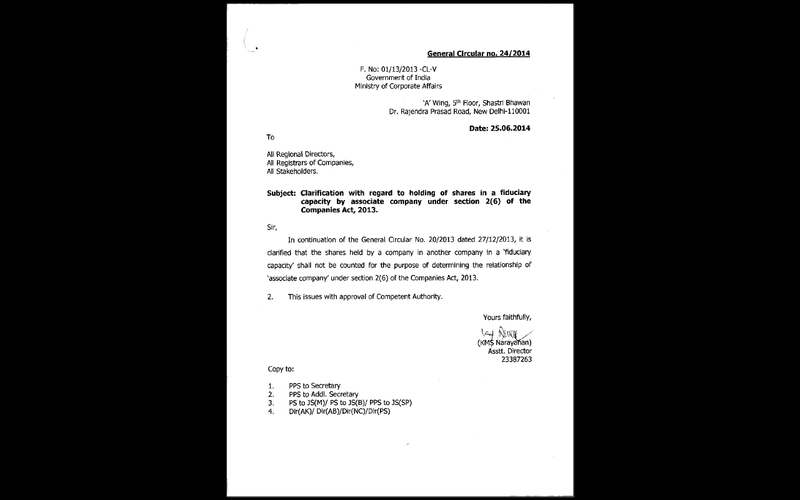 10,000 upon the AO who has filed this appeal… The said payment should be made to the assessee within one month from the date of receipt of this order. Registry is also directed to mark a copy to the Chairman, CBDT so that in future the Income Tax Commissioners, who are responsible for filing appeal before the Tribunal, would take proper care to scrutinise the issues before authorising the AO to file appeals before the Tribunal. Where assessee had not collected and deposited Service tax but on being pointed out, deposited the same along with Interest, can it be treated as expenditure deductible under Section 37 of the Income Tax Act, 1961? 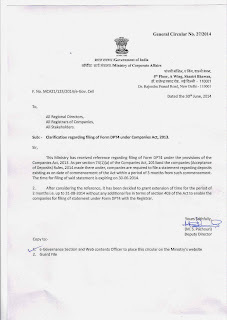 The Department conducted an audit of records of Kaypee Mechanical India (P.) Ltd. ("Kaypee" or "the Assessee") for the Financial Year 2003-04 to 2006-07. During the audit, the authorities raised an audit objection pointing out that the Assessee had not collected the service tax on mechanical erection and installation of plant and machinery, structure work, piping work, etc., for the period from financial year 2003-04 to 2006-07. Therefore, a demand of service tax of Rs. 23,07,450 along with interest of Rs. 9,36,353 was raised on Kaypee. The Assessee deposited the amount of Rs. 32,44,004 towards the demand raised by the Department out of its own pocket. Further, Kaypee claimed the deduction of Service tax paid along with interest as business expenditure. The Revenue contended that the Assessee should not be allowed to claim deduction of the Service tax paid along with interest as expenditure since the amount has been paid by Kaypee as an infraction of law. 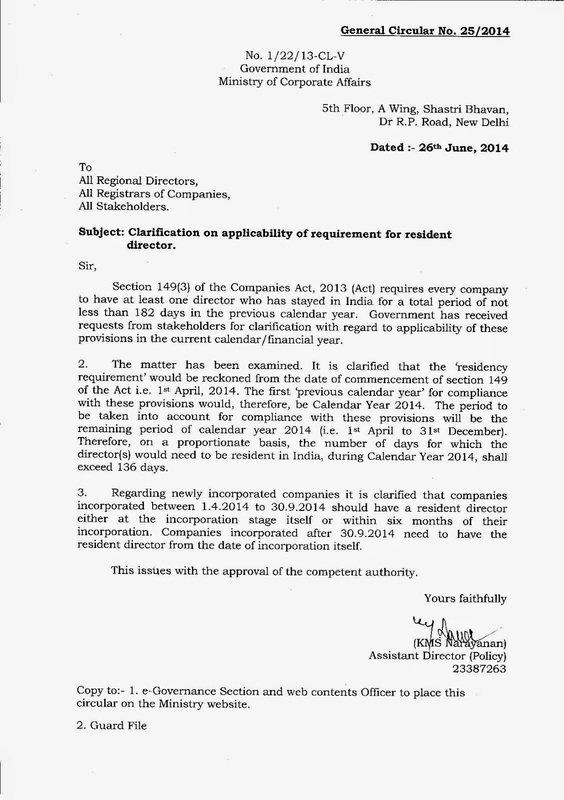 The Commissioner (A) and the Hon'ble CESTAT accepted the contention of the Assessee. The Hon'ble CESTAT held that Kaypee has rightly debited the Service tax and interest thereon as expenses in the P/L account. The Revenue did not produce any material on record that the Service tax including interest which is debited in the P/L A/c had been recovered by Kaypee from its Service recipients. Therefore, the Service tax and interest thereon shall be treated as expenses of the Assessee, which were incidental and arising out of the business of Kaypee. The interest payment is compensatory in nature. Accordingly, it was held that the expenses incurred by the Assessee have direct nexus with the business operation of Kaypee. Therefore, the expenses are allowable under Section 37 of the Income Tax Act, 1961 ("the IT Act") as incurred wholly and exclusively for business purposes. The Revenue filed an appeal against the order of the Hon'ble CESTAT with the Hon'ble Gujarat High Court. The Hon'ble Gujarat High Court also upheld the view taken by the Hon'ble CESTAT and held that the amount was expended by the Assessee during the course of business, wholly and exclusively for the purpose of business. If the Assessee had taken proper steps and charged Service tax to the Service recipients and deposited with the Government, there was no question of the Assessee expending such sum. It is only because the Assessee failed to do so, that he had to expend the said amount, though it was not his primary liability. Be that as it may, this cannot be stated to be a penalty for infraction of law. It is equally well settled that payment of interest is compensatory in nature and would not partake of the character of penalty. Accordingly, it was held that Service tax and interest paid by the Assessee were rightly claimed as deductible business expenditure under Section 37 of the IT Act. Therefore, the contention of the Revenue was rejected and the case was decided in favour of the Assessee.